Jerry’s resume speaks for itself. As a resident of Prairie Village for more than thirty years, Jerry knows the people of the 21st District, what their concerns are and how to address those concerns. He has spent his career in public service, education, economic development and business. He has the proven skills, experience and leadership necessary to effectively represent the people of the 21st District in the next session of the Kansas Legislature. To learn more about Jerry’s contributions to our country and our community please click below. Native Kansan and Prairie Village resident for over 35 years. Jerry and his wife Deanna, a former teacher and high school counselor at Shawnee Mission East High School have been active and involved residents of the 21st District for over thirty years. Their son, Ben, attended Tomahawk Elementary, Mission Valley Middle School and is a graduate of Shawnee Mission East. Ben recently earned a Master’s Degree from the University of Arkansas. Jerry and Deanna have been involved in a variety of school and community activities throughout their long time residency in Prairie Village. Upon receiving his first Bachelor’s Degree from Kansas State, Jerry applied and was accepted to Naval Officers Candidate School in Newport, Rhode Island. After completing his training at OCS he was commissioned as an Ensign and began serving a thirteen year active duty and reserve career as a United States Naval Officer. Over the past 35 years Jerry has been an active and involved member of the community. 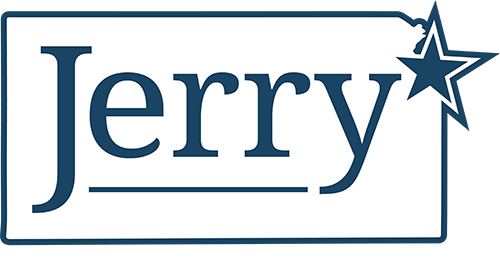 Jerry is currently serving or has previously served on NUMEROUS local Boards and committees. He has acquired vast experience working with and supporting our public schools, our business community and organizations which support the arts and economic development. Jerry's extensive experience working in our schools and advocating for teachers means he'll fight every day for our children's education. Jerry has a history of proven leadership in our community. Kansas National Education AssociationPresident, United Urban UniServ Dist. Jerry is an entrepreneur, businessman and is the current owner of two successful small businesses.